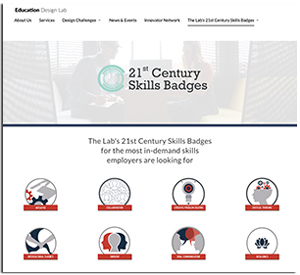 Education Design Lab, a nonprofit that's testing out new models for education that integrate credentials, has teamed up with digital badge service provider Credly to solidify a program that will let colleges and universities issue nationally designed digital credentials that recognize workforce-relevant skills. Among the institutions that have bought in: George Mason University. The lab has worked with GMU for several years as the school developed a blended program to teach students skills in empathy, creative problem solving, intercultural fluency and other soft skills employers have reported that they value in surveys. A few months ago, the lab issued a free digital badge toolkit to help schools set up programs that would issue badges to students who had earned them for use in LinkedIn, resumes and portfolios. Under the new arrangement, select colleges and universities will become "authorized issuers" of the lab's 21st century skills badges. The arrangement with Credly will enable institutions to "readily issue badges that are aligned to a new national standard and directly connect to labor market opportunities," according to Kathleen deLaski, founder and president of the lab. The goal, she added in a press release, is to scale the credentials and broaden the network of participating schools and employers as part of validating "early indicators that these credentials provide clearer signals for in-demand skills to the hiring process." This effort is a runway for the lab's next phase of work, called "#TeeUpTheSkills," in which participating schools will set up their training and badging programs. The participants will receive free access to the lab's implementation and support services, Credly's premium services and promised access to employers. In return, the test pilots agree to follow the badge framework, share their use cases and metrics and identify a set of upper-class students who will earn the badges and provide a base for the project on campus. More information about the program can be found on the Education Design Lab website.